(Bloomberg) -- The equity rally still has legs judging by the price action of yesterday, with traders buying and covering on any weakness, and futures pointing to a higher open again this morning. 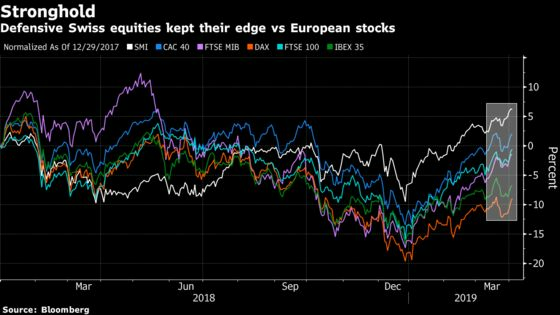 While investors seem to have regained an appetite for risky assets, it’s surprising that a defensives-heavy index like the Swiss SMI has kept up with European peers this year. Novartis, Nestle and Roche account for about half of the benchmark, and they have performed well so far in 2019. So how does the country’s currency play into this? The franc is popular among investors at times of heightened market stress. It hit a 20-month high against the euro last week and is hovering near the 1.12 euro key level. Investors usually turn to the currency when sentiment is souring, which could be a sign that concerns are mounting. In fact, forex options traders are betting on further gains for the franc. The strengthening of the franc could become a problem for Switzerland’s exporters, notably its manufacturers. Kepler Cheuvreux highlighted recently that companies with high sensitivity to fluctuations in the currency include Straumann, Sonova, Partners Group and Georg Fischer. Swiss watchmakers could also be sensitive, especially as the demand for luxury watches has been slowing. 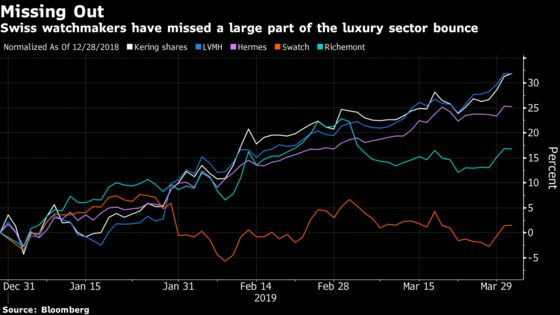 This could become a potential drag for Richemont and Swatch, with about 20 percent and 23 percent of sales in Europe respectively. Since 2015, the Swiss National Bank has used a deposit rate of minus 0.75 percent and pledged to wage interventions, if needed, to maintain the interest rate differential with the euro area and keep the franc from appreciating. SNB’s Governing Board Member Martin Schlegel said earlier this week that the bank still has room to ease monetary policy, and Kepler Cheuvreux sees a surge beyond 1.12 franc per euro as “unsustainable,” as the SNB won’t tolerate a strong Swiss franc. Makor Capital Markets strategist in Geneva, Stephane Barbier de la Serre, says the SNB stance explains the actual floor, but thinks the franc is “quietly, discreetly, almost stealthily” breaking the key support against the euro. 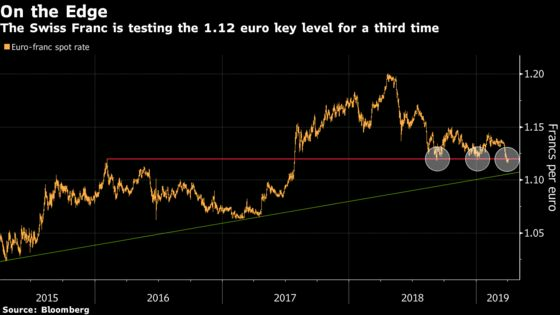 The strategist sees no particular trigger, just another demonstration of the ongoing endless appetite for defensive assets, saying that the next medium-term target for the franc is 1.1060 per euro. Is there a balance between the defensive features of the Swiss currency and the protective profile of Swiss equities? As the pound can weigh on the FTSE 100, there could be a point where Swiss stocks become less attractive because of the currency’s strength against the euro. They have managed well so far. In the meantime, Euro Stoxx futures are trading up 0.7% ahead of the open. Watch the pound and U.K. stocks after Theresa May reached across the aisle for cross-party talks to help work out a joint plan that would stand a chance of getting approved by Parliament, while planning to ask the EU for a further delay. Watch miners as iron ore prices surged again on increasing supply concerns, after Brazil’s mining regulator ordered that 56 tailings dams should close. Watch shares in companies like BHP, Rio Tinto, Anglo American and Ferrexpo among miners and keep an eye on steel stocks including ArcelorMittal and Evraz. Watch trade-sensitive sectors after U.S.-China talks kick off again Wednesday and after a report that the U.S. and China have ironed out most of their differences in trade negotiations. UniCredit Is Said Near $900 Million Sanctions Accord With U.S.
RBC says more visibility on earnings will be needed for European investment bank shares to re-rate from what are currently optically cheap levels. Sector does look cheap but is only attractive if earnings start to recover. UniCredit rated top pick and outperform ratings on ING and BNP Paribas. French banks coverage is reinstated at BofAML with a cautious view, setting Credit Agricole at buy, BNP Paribas and Natixis at neutral and SocGen at underperform. BofAML says in note that even with valuations low as they currently are, they remain unattractive overall as approach late cycle. Cites failure of the French banks to deliver on medium-term targets, says profitability is structurally low, and capital positions are tight. 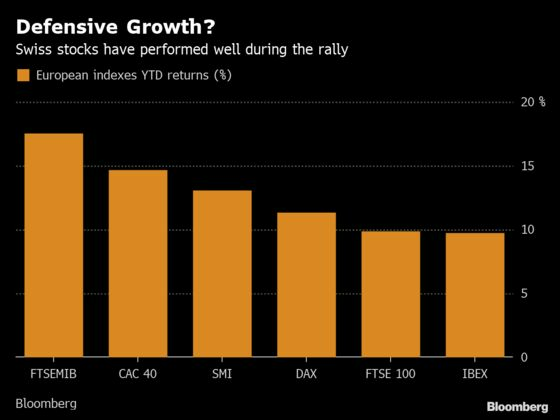 Arkema is the second-cheapest stock among European industrial-chemical makers, although this is fair as reflects concerns about co.’s past and future performance, Berenberg says in note. Broker initiates stock at hold, with PT EU97. Jefferies downgraded Halma’s to hold from buy, saying the share price rally and valuation after “stellar” performance can’t justify its positive view anymore. Expects co. to continue to trade well, but doesn’t see any significant consensus upgrades.